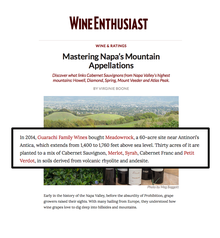 In 2014, Guarachi Family Wines bought Meadowrock, a 60-acre site near ­Antinori’s Antica, which extends from 1,400 to 1,760 feet above sea level. Thirty acres of it are planted to a mix of Cabernet Sauvignon, Merlot, Syrah, Cabernet Franc and Petit Verdot, in soils derived from volcanic rhyolite and andesite. Wine Enthusiast featured the 2013 Guarachi Family Wines Sun Chase Pinot Noir in their “Top Shelf” email blast. The wine, which was recently named “Editors’ Choice” and scored 94 points, is described as “a beautifully floral mix of rose petal and violet followed intricately by juicy, subtle red fruit and buoyant acidity.” In addition, Wine Enthusiast gave Montes Alpha Carmenere 2012 a score of 91 points. Shanken News Daily, Wine Business.com and Wine Industry Advisor featured the news of Guarachi Family Wines’ release of the Sun Chase Pinot Noir 2013. This is Guarachi Family Wines’ first single vineyard bottling from the Sun Chase estate, and illustrates why it is considered one of the most sought after vineyards in Sonoma County. Alex Guarachi and Guarachi Family Wines have been fortunate enough to receive such tremendous and considerable reviews by these notable members of the wine industry. We would like to share these with you below. . .
"A stunning effort from Beckstoffer's famously gravelly site, this is a 100% varietal wine from one clone, made in a tiny amount. Exquisite aromas of blackberry and leather surround a velvety texture and spiky acidity, the tannins integrated and lengthy, with room to grow over time. Powerfully full bodied, this is a classic representation of the valley in expansive celebration of a ridiculously good vintage. Drink now through 2023." "Plenty of subtle tile, dust and black currant character. Full body, silky tannins and a savory finish. Layered and gorgeous." "The 2013 Cabernet Sauvignon Beckstoffer Las Piedras Single Vineyard is delicious wine with beautiful cedar wood, crème de cassis, blackberry, licorice, and a touch of camphor and incense. The wine is full-bodied, powerful (15% natural alcohol), with a multilayered mouthfeel and skyscraper-like structure and intensity. This is a beauty, and a top, top wine of the vintage. Drink it over the next 25 to 30 years."